Adding curtains is a fast, easy way to make any room look more finished. Whether you buy premade panels or sew your own, knowing how to measure your windows is the first step. Once you know the size of your windows and how long you want your curtains to be, you can make the rest of your design decisions. Measure your window's height. Measure and note the height from where the rod is (or will be, if not already installed where you've chosen to place it--inside or outside of the window frame) to whatever length you want your curtains. 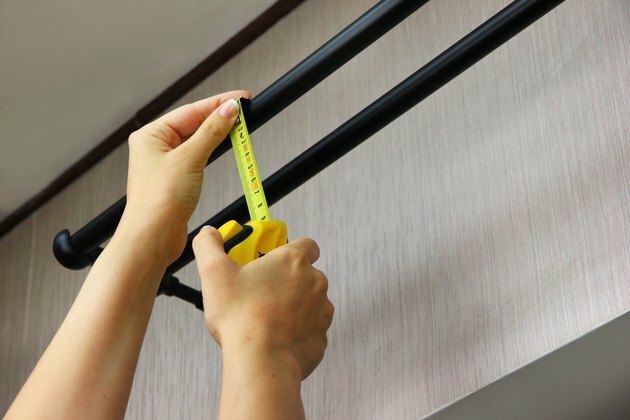 For casement- or grommet-style curtains, measure from the top of the rod. 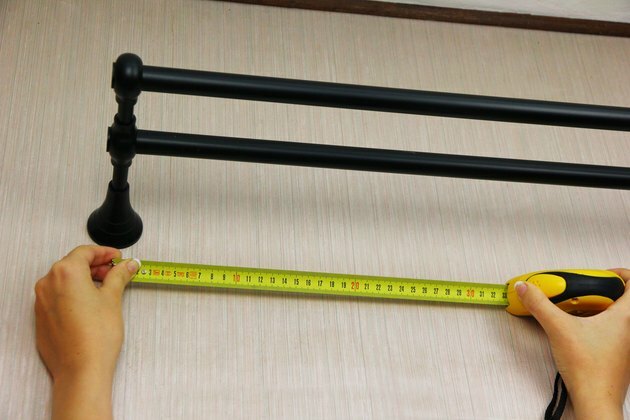 For clipped-on curtains, measure from the middle of the rod, which should only be a very small difference from the top of the rod. Measure the width of your window starting at one end of your rod to the other end of the rod. If it's an inside mount, this will simply be the measurement at the inside of your window frame. If it's an outside mount, the full width will be at least as wide as the outside of your window trim, but it could be much wider depending on how you have mounted the rods. Example calculation for premade panels: If your window is 36 inches wide and you need 84-inch-long curtains, you would double the window measurement (36 times 2 equals 72) to get your curtain width. Doubling the window width ensures proper fullness in your curtains. 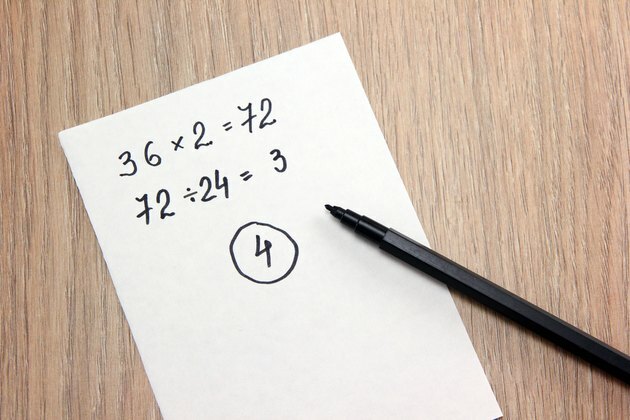 If the panels you plan to purchase are 84 inches long and 24 inches wide, you would divide 72 by 24 to get the number of panels you need (72 divided by 24 equals 3), then round up to the next even number to arrive at the number of panels you will need to buy. For this example, you would need four panels for adequate fullness. Purchase panels in even numbers to give a more balanced appearance to your windows. Example calculation for DIY panels: Your window is 36 inches wide and you need 84-inch-long curtains. Double the width to get 72 inches. If you want two panels, you must add 1 inch to each panel width to allow for side hems, so you will make two 37-inch-wide panels. Add 6 inches to your finished curtain length; each panel thus needs 90 inches of fabric length, for a total of 180 inches for both panels. 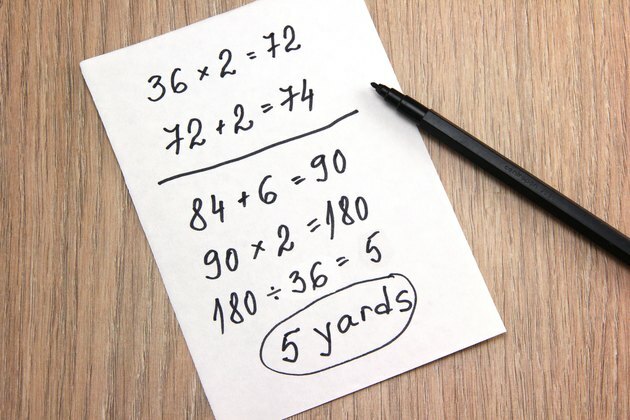 Divide by 36 to get the final yardage (since there's 36 inches in a yard), in this case, you will need a total of 5 yards to make both panels. Rochelle Karina has been writing for more than 20 years; her opinion and humor pieces have been published in local newspapers and international magazines. Karina was the creative force and principal writer behind the eco-design and decor blog Inspired Habitat. A San Diego native now living in Baltimore, she currently maintains several relationship blogs and has completed two novels, as well as writing for Demand.